What Information Is Displayed in the System Log? What Information Is Displayed in the Query Log? What Information Is Displayed in the Index Log? Why Is the Query and Index Log Empty? The Administration Logs page displays all operations in the Administration Tool that were triggered by a user interaction. 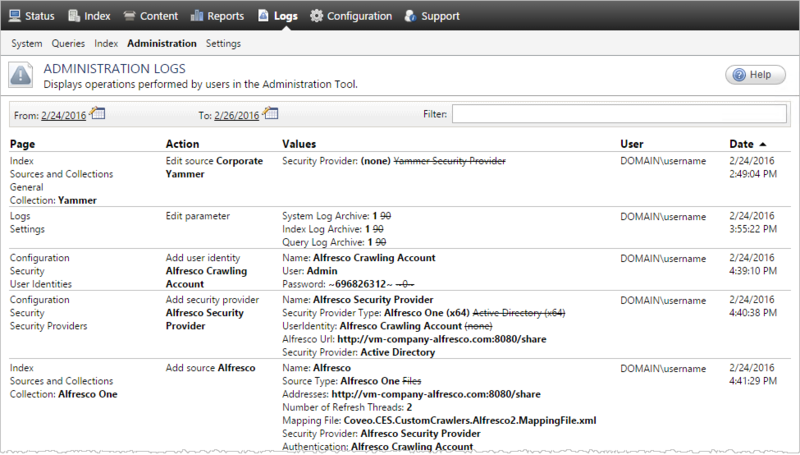 Every performed event appears within seconds in the logs, meaning the page can be used to monitor the Administration Tool. This page is also useful to help solving support cases by providing relevant information such as the owner of each source and the user responsible for errors or unauthorized content permission changes. In the filter toolbar, next to From or To, click the calendar icon. In the calendar picker that appears, use the left and right arrows icons to reach the desired month, and select the date from or to which you want to review operations. Repeat the process for the other calendar icon. In the filter toolbar, click the Filter box. Enter the value you want to filter on, and then press Enter. Note: Except dates, which are delimited using the calendar pickers, every text value contained in the logs can be filtered on. Click the column header titles to sort the user actions by Page, Action, Values, User, and Date. If the list is already sorted by the selected column header, the sort will change from ascending to descending or vice versa. Note: Column values are displayed in a user-friendly manner to clearly show before and after values following changes. Most of the time, you will be familiar with the logged values since they reflect parameters, pages, names and labels that appear in the Administration Tool interface, facilitating the understanding of the logs. The Administration Tool page in which the operation occurs. The precise operation (e.g., Delete source [name]). All form field values are compared before and after a user performs an action in the Administration Tool, and only the modified values are logged. In the logs, original values are crossed-out. Passwords are hashed for obvious security reasons. The time and day of the action in the Windows configuration panel format.